46,569,627 seconds in the making. 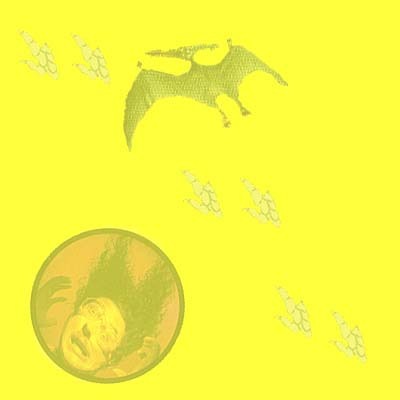 Production Summary: Eleven songs were recorded specifically for this album, as "Waffle King" was written and recorded in 1990 and originally intended for Off the Deep End. Of the remaining songs, ten were newly written for this album, as "Harvey the Wonder Hamster" was originally written in 1985 for that year's Al-TV special. Additionally, "I Was Only Kidding" from Off the Deep End was originally written for this album before Al decided that the "I really love you...not!" lyric might sound dated by the time the whole album was completed, so he quickly recorded it just in time for it to be added to Off the Deep End, causing "Waffle King" to be moved to a b-side and then onto this album. Dr. Demento Status: Eight of the album's twelve songs have aired on the syndicated Dr. Demento Show, with the last songs to premiere on the show being "Young, Dumb & Ugly" and "Bohemian Polka," both on November 21, 1993. By the time The Dr. Demento Show ended its run on terrestrial radio on June 5, 2010, "Traffic Jam," "Talk Soup," "She Never Told Me She Was a Mime," and "Waffle King" remained the four songs from the album never played on the program. Tour Status: As of this update, 75% of this album has been included in a regular tour setlist. The first ALbum to feature Al pictured on the actual CD. The first ALbum to get more promotion on MuchMusic than on MTV. 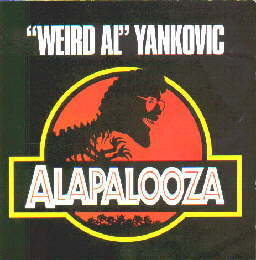 Ties with Dare To Be Stupid, Polka Party!, and the UHF soundtrack as having the fewest number of parodies of any ALbum, four. Debuted at #61 in Billboard. It would stay on the "Billboard 200" chart for twenty-four weeks (not counting two weeks during that span in which the album didn't even make the chart). Early versions of the cover artwork had a red background to better resemble the Jurassic Park logo. 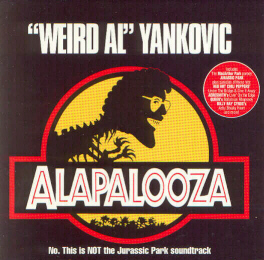 The design was later changed to feature a yellow background out of fear that retail shoppers would confuse Alapalooza with the Jurassic Park movie soundtrack, despite the fact that Alapalooza had a hype sticker reading "No, this is NOT the 'Jurassic Park' soundtrack" glued to the shrinkwrap. (see pics) When Warner/Elektra/Atlantic reissued Alapalooza in mid-1996, the original red-background artwork started to resurface. The only ALbum that contains a "polka medley" consisting of just one song. Released in Japan on November 19, 1993. The Japanese version contains an additional bonus track of Al singing "Jurassic Park" entirely in Japanese! 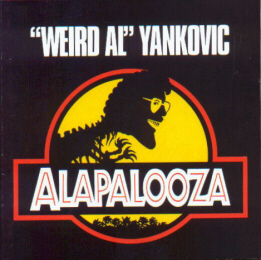 The Japanese version of the song would finally make its U.S. debut on the Medium Rarities bonus disc found in 2017's Squeeze Box: The Complete Works of "Weird Al" Yankovic. ALbum title/song connection: The cover is a parody of the Jurassic Park movie logo, while the film is both the title and subject of the lead-off single. The album's title, however, can be traced back to the first MuchMusic AlMusic in 1992, specifically when Al is listing upcoming concert dates. The first ALbum with a lead-off parody single that is not based on a current hit song. Features Al's first country parody. Al's only release to go Double Platinum anywhere. This page was last updated March 13, 2019. Scans of Canadian album and French sticker courtesy of Dave "Elvis" Rossi. Alapalooza ©1993 Scotti Bros. Records. ©1999 Way Moby/Volcano Entertainment III.